FTP Maker lets you create a custom FTP Uploader package to be distributed to employees/customers/co-workers to simplify procedure for sending files to your FTP server. 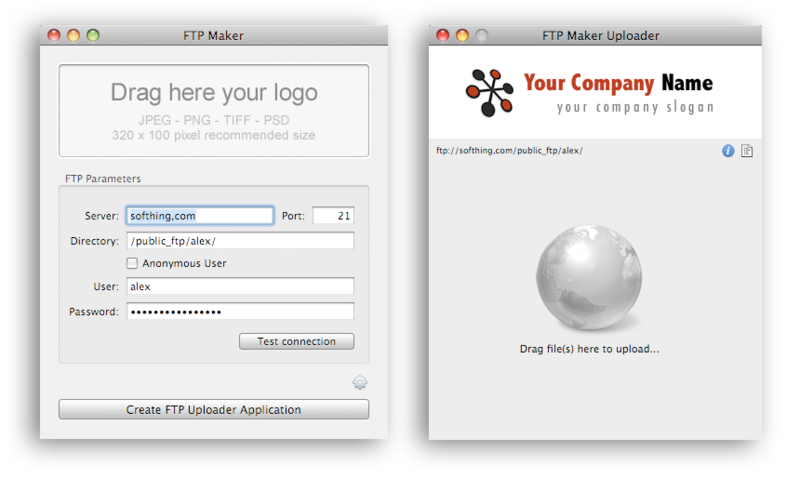 The advantage of using FTP Maker instead of a normal FTP client is that the application generated contains all the connection parameters, so the user does not have to specify any settings or set specific parameters. In addition, the FTP Uploader can be customized with the logo of your company. Once launched the Uploader, the user will only have to drag and drop files or folders into it, forgetting about the various FTP parameters: the Uploader will handle them automatically.